Series C - Videoscope with "Smarter Insights, Smarter Savings"
Olympus’ entry-level videoscope provides exceptional articulation, durability and great optics to get you the image you need. The instrument is built for use anywhere you need it and packed with features usually reserved for more expensive units. The Series C will save you time and money. The Series C delivers value low cost, high workload, and great support. Despite the low price, the Series C videoscope is built on Olympus technology. Olympus is a technology leader with 100 years of optical and 70 years of endoscopic inspection experience. Only Olympus Series C ensures trusted quality, durability and warranty for this low price. The Series C features ease of use, durable construction and portability to assure the highest throughput of work. Remote inspections can be done for 120 min (battery operated), without interruption. The return on investment is guaranteed with this reliable unit. Olympus has service centers in the Americas, Europe and Asia. Our highly trained staff provides top-notch service. The Series C videoscope is designed to provide quick and easy inspections of difficult-to-reach areas. Olympus’ entry-level videoscope provides exceptional articulation, durability and great optics to get the image you need. The instrument is built for use anywhere you need it and packed with features usually reserved for more expensive units. The Series C will save you time and money. Series C is lightweight and ergonomically designed to fit in the palm of either the right or left hand. Add the convenience of an available shoulder strap. Lithium-ion battery powered Series C delivers 120 min of uninterrupted inspection. Convenience of on-board charging between projects keeps the Series C deployment ready for the next inspection. * Please use the BN-VF815UWIE battery specifically for the Series C.
Small and lightweight, the Series C carrying case holds everything you need for every inspection project. The hard case protects the instrument from damage during transportation to and from the inspection site. Travel quickly and confidently with this carry on case. Thumb-driven joy stick provides full articulation control and up to 120° angulation of the distal end. Combined with Olympus’ proprietary spring neck, the insertion tube can easily navigate tight spaces, around obstacles and bends to position the camera right on the target. Series C is specifically designed with an intuitive user interface. Designed for ease of use, both the expert and the first-time inspector can use the Series C to successfully inspect objects. There is no need for special training. With a single tap on the Series C touch screen, gain instant access to many features in the icon-driven menu to get the inspection done. English, German, French, Italian, Spanish, Portuguese, Russian, Polish, simplified and traditional Chinese, Korean and Japanese. ZOOM Get a closer look with a 3x digital zoom. BRT Quickly set target image brightness. Series C automatically sets exposure and gain. VIEW/THUMBNAIL Instantly review the last image from the collection of all images taken. LIGHT Conserve power by turning on/off the high power LED. MENU Access the simple-to-use menu. TITLE INPUT Use the on-screen keyboard to label your inspection images. Stay organized, communicate your findings clearly and effectively. WHITE BALANCE Optimize image color balance with a single tap on the touch screen. DISPLAY Provide a grid overlay to help scale flat surfaces, or a perspective grid to gauge distances within a object. Use the touch screen to draw directly on the image for highlights or annotations. SETUP Personalize your Series C by selecting how images are taken and composed. Use the setup menu to select the language of use. Keep the inspection quick and efficient. The button on the back of the Series C enables you to freeze an image, take a picture or start a video recording. Inspect defects such as burrs and cracks inside parts or areas that have no direct visual access. Series C videoscope performance is powered by Olympus optical and precision device expertise. The videoscope captures an image with the desired brightness by combining 8 brightness settings, glare reduction, high intensity LED and light sensitive CCD camera chip technologies. The purity of the white LED light combined with superior Olympus optics assures that the most natural color and image is captured and delivered to the 3 in. VGA monitor. Whether looking for defects on highly reflective metal or looking at corrosion in a dark pipe, count on the videoscope to capture the image you want. Make an impression, project the image on a big screen from the Series C HDMI video output port. Use the included HDMI cable to transfer the image to a wide screen for display. * Please use a display monitor with HDMI terminal supported 720 x 480 resolution and 60 Hz refresh rate. Images in JPEG format or MPEG-4 video files can be stored to a SDHC card. Once removed, the SDHC card can be used to transfer images or videos to a computer. Alternatively, the Series C unit can be connected directly via a USB cable. * The Series C supported a 4 - 32 GB SDHC card, which is class 6 or above. The Series C is designed for long product life, it features an abrasion-resistant insertion tube with a tungsten outer braid. The proprietary spring neck design of the distal end reduces stress when navigating through tight bends. The hood on the distal end can easily be replaced when worn. Consequently, more inspections can be done with minimum downtime. The insertion tube is constructed of four layers to provide long durability. Two stainless steel layers, a waterproofing layer and a tungsten outer braid combine to make this insertion tube 100x more resistant to abrasion than tubes made solely of stainless steel. The protective cap on the distal end can easily be replaced when worn. Consequently, more inspections can be done with minimum downtime. Olympus has service centers in the Americas, Europe and Asia. Our highly trained staff provides top-notch service. Olympus recommends Series C registration to receive updates and all product related information. The Series C is designed to operate in various fields such as automotive, manufacturing, power generation, plant maintenance, security and aviation. Thanks to its high cost-performance, you can add the Series C to your inspection instruments as daily use for quick checks. The Series C videoscope features a durable, abrasion-resistant insertion tube that is perfect for checking cast engine parts and car parts during the manufacturing process. 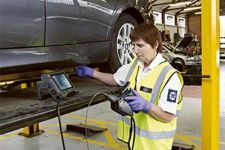 The Series C videoscope can also be used for routine maintenance inspections. In case of inspection for a fuel nozzle and a hydraulic component with small diameter hole, Olympus offers IPLEX TX videoscopes. The Series C videoscope is durable and cost-effective. It is designed to integrate in any manufacturing process. The flexible insertion tube, easy-to-use touch screen and HDMI image sharing, makes the videoscope a valuable asset for any manufacturing inspection station. For inspections requiring smaller access (e.g., 4 mm), side view, reliable measurement for small faults or parts, or an abundance of light for larger cavities, Olympus offers IPLEX RT videoscopes. The battery-operated Series C videoscope is lightweight and compact. With its convenient carrying case, the videoscope can be taken anywhere. Its portability makes it perfect for quick checks of pipes and valves during routine maintenance inspections. In applications such as a heat exchanger or boiler, Olympus offers IPLEX Long Scope Solutions. For inspecting a power generating turbine, Olympus offers IPLEX RX videoscopes. Because of the water-proof layer included in the construction of the insertion tube, oil cannot affect performance of the videoscope. That feature makes the Series C videoscope a perfect tool to inspect oil pumps and working valves. Take this portable unit anywhere in the plant to do a quick check and assure that everything is working at peak efficiency. For large space inspections such as a cistern or a duct, Olympus offers IPLEX RX videoscopes. The easy-to-use touchpad makes the Series C videoscope ideal for property checks at borders for security and customs inspections. For inhospitable environments or where portability is important, Olympus offers IPLEX UltraLite videoscopes. The Series C videoscope can record high-quality images to its SDHC card, which is ideal for checking the air frame or other components in an airplane. In case of inspection for a gas turbine or an auxiliary power unit (APU), Olympus offers IPLEX FX videoscopes. The images recorded with the instrument can be displayed on a computer, etc., but playback on the instrument of images recorded with an image recording device such as a digital camera or a computer is not supported. To play back movies recorded by this instrument on a PC, the PC must be installed with Windows Media Player Ver.12 or a later version. Names of companies and products in this document are proprietary trademarks or registered trademarks. SDHC Logo is a trademark of SD-3C, LLC. Liquid Resistance Insertion Tube No damage when exposed to machine oil, light oil or 5% saline solution. Waterproofing Insertion Tube Waterproof construction. Can be used underwater. Other Parts than Above Cannot be used in the rain or underwater. Meeting operating environment specifications does not constitute any guarantee against damage to or malfunction of this equipment. Use the AC adapter in an indoor environment (at ambient temperature).